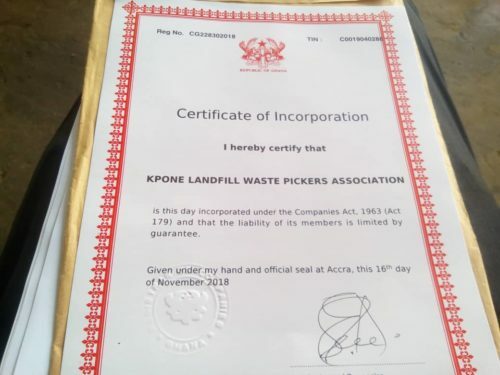 Certificate of registration of Kpone Landfill Waste Picker Association. Inspired by CTEP, the Argentinean union of popular economy workers, specially by waste pickers achievements in Buenos Aires organized in FACCyR, Kpone Landfill Waste Pickers Association is now moving forward by achieving things that “we are late in“, says Johnson Doe, Accran delegate to the Global Exchange of waste pickers held in Buenos Aires last October. They are seeking to move forward on recognition of their work, fight against discrimination and worker’s rights. By now, they are focusing on having enough solidarity stick among workers. At the same time, they registered the organization and now have their legal certificate and their bank account to strengthen commercialization of recyclables. “We just made a dues card for every member to keep records of what ever they contribute for our welfare”. “We also provide ourselves a banner for the organization (flyers) for publication”.